February is an exciting month for us as we are seeing the return of a crowd favorite beer, as well as a few, never before done at Black Project, experimental beers. All listed prices include 8% sales tax and applicable fees from the online purchase system. Bottle limits are TBA on the day of the public sale. First off, we have the return of IVY BELLS, our fruit punch sour beer. IVY BELLS is a custom blend of solera-fermented spontaneous ales. We then refermented with pineapple, pink guava, blood orange, raspberry, passion fruit, sweet cherry and tart cherry in a golden base beer blend. MK2 is a berry forward, jammy and tart, comprising mostly of raspberry and cherry. MK3 is bright, citrusy, and slightly bitter, with pink guava and blood orange being the dominant flavors. IVY BELLS is an expression of what multiple fruits can do together, instead of highlighting what each individual fruit has to offer. Next up is SUNBEAM, our Noyaux-inspired beer. Noyaux is an almond flavored liqueur made with stone fruit pits that is cooked into a brandy. We created our version by taking the fresh stone fruit pits from our STARGATE series and racking our sour golden base onto them in a barrel to rest for months. The resulting beer is slightly tart, chocolate and almond forward, with a dry citrus finish. Noyaux beers are not an often done style and we are excited to see the results of this experiment. HABU is a blend of three-year traditional, Lambic-inspired, coolship spontaneous ale that follows the Méthode Traditionnelle guidelines. The blended base beer was refermented with two different kinds of whole tart cherries. We used Montmorency and Balaton cherries and included the pits in freshly dumped Law’s Whiskey barrels. After a few months in the Law’s barrels, HABU was moved into new Heaven Hill barrels and vanilla bean and cocoa nibs were added to the beer. The double barrelling process allows the oak vanillin and bourbon character to shine alongside the cherry, chocolate, and vanilla harmoniously. The resulting beer is complex and fruity with a strong bourbon back bone and nuanced vanilla and chocolate characters. HABU is a new series of beer that we have been anticipating for months now. By taking our 3-year spontaneous blended ale and refermenting it on cherries for many months in both stainless and oak to create CYGNUS, our Kriek inspired ale, we racked the finished beer into Law’s Whiskey barrels, and then added cacao nibs and madagascar bourbon vanilla to rest. First come, first served. Limits TBA. Proxies ARE allowed. Pickup ONLY in the taproom, during regular business hours. Black Project is excited to announce the release of this year's version of one of our longest-running and most sought-after series of beers: STARGATE. STARGATE is made by fermenting local whole stone fruit in various fresh spirit barrels. The idea is to create a beer that is in perfect harmony between the spontaneous-solera base beer, the unique fruit varietals, and the character of the specially-selected spirit barrels. STARGATE was first released under a different name: Peach-Rye DREAMLAND. The beer was such a hit with fans that the next year we committed to giving the beer its own name and using whole Colorado fruit. From the first bottles produced, the STARGATE releases have continuously been some our highest-rated and most sought-after beers. Every year we have been expanding our number of offerings as we find great fruit and awesome spirit barrels that will complement each other. The STARGATE series is a beer that we have always had a hard time making enough to satisfy the intense demand for the bottles. This year, the harvest was good in Palisade so we elected to make several different variants. For logistical reasons, the beer will be sold mostly as sets of four bottles. These variants showcase the variety of stone fruit we source each year, directly from the Western Slope of Colorado. Thousands of pounds of fruit were brought in and processed by hand after waiting for peak ripeness. A majority of the pits are left with the fruit during fermentation.This adds an additional layer of complexity and depth of flavor that plays perfectly with the tart fruit, as well as vanillin and whiskey notes from the barrels. Fruit fermentation actually takes place within the specially selected spirit barrel. This is a special technique that allows for additional subtleties to be extracted from the barrel. It creates a better overall balance to the beer than the more typical method of fermenting/refermenting in a different vessel and then “aging” in the spirit barrel post-fermentation. STARGATE bottle sets will be available for online pre-sale starting at noon on January 22nd. There will be a limited amount of single variant bottles also available, as well as a specially curated list of vintage bottles - available in limited amounts. Bottle Pick-Ups will be January 25, 26, & 27. Proxies are allowed. STARGATE sets are $80 for four, 500mL bottles. Capped and corked. Individual bottles, if available, are $21 each. All prices include sales tax and processing fees. Pre-Sale will be live at 12 noon (MST) on January 22nd, 2019. We are pleased to announce that we are switching to a new bottle release format starting with this month’s release. Here are the details right off the bat, followed an explanation of the new release format and the reasoning behind the switch. Online Pre-Sale begins on Wednesday, December 19th at Noon (MST) and runs until Thursday, December 20th at 11PM (MST). However, everything is first come, first served so I would recommend signing on as close to the start as possible. All listed prices include 8% sales tax and applicable fees from the online purchase system. Bottle limits are TBA on the sale of the sale. Since this month is crazy for everyone, we’ve decided to extend the bottle pick-up window. Instead of one weekend, the bottles can be picked up in the tasting room starting Friday, December 21 at 2PM, and the window will extend for two weekends and the short Christmas week, until December 30th at 8PM. Please note that we are closed Christmas Eve and Christmas Day. A little over one year ago we moved our retail bottle sales to primarily an online lottery format. While I think the system has worked relatively well, I’ve decided that for a number of reasons, it is time to once again revisit the best way to get our bottles into the hands of the public. Our goal has always been to be able to allow as many fans as possible to acquire our bottles, no matter where they live, while also respecting our local / tasting room supporters, and finally - respecting everyone’s time. The feedback we have received over the last 12 months is that perhaps the online lottery system is not necessarily the best value for our customers’ investment of effort. I think that as we have taken a step back and looked at the process it adds an unnecessary amount of confusion, tracking of dates, and overall time taken from the customer in order to get (possibly) a single bottle of beer. For quite some time we have been ruminating on how best to make the bottle purchase system easier and less confusing. The first effort we made towards making the process easier has been enlisting the help of Craftpeak to put a voucher and customer management system in place. This has been a huge help, but the underlying issues of a lottery format (enter, wait, selection, purchase, wait, pick-up) are inherent to the system. So today I am excited to announce the end of the lottery system and the beginning of direct, online, bottle pre-sales. Craftpeak is geared towards this type of system, has assured us they can handle any server demands, and runs the back-end of these types of releases for many great breweries around the United States. The monthly bottle release will be when new bottles are first made available to the public. This is a direct replacement for the lottery - instead of entering, waiting, winning, and then purchasing, customers will simply log on when the sale opens and purchase. However, unlike the outgoing lottery system, we will also often have additional bottles available on a limited, first come, first served basis. These would be bottles that might be available as an add-on on pick-up day, but are not large enough for a full-blown lottery. We may also pull a few cases of beer from our back-catalog cellar and put those online as well, first come, first served. The online voucher format means that a customer, for their efforts, may be able to purchase more than one bottle (either of the main release or by adding additional bottles from a limited batch). We’ve heard time and again that the effort from the lottery and pick-up (especially with a proxy) was simply not worth it for one bottle of beer, and I do think that is a valid criticism. Inevitably some folks will not be able to get online and purchase the bottles before some/all of them sell out - but my view is that if that happens, at least you know vs a lottery where many entrants do not win, but still have to keep the purchase and pick-up “on their radar” for nearly a week until they find out if they won or not. As with the lottery, ANY vouchers purchased will have to be exchanged for the bottle during a designated pick-up weekend (by either the customer or their proxy). No system is going to be perfect and there are definite pros and cons to this new system, but after a year of lotteries and thinking about the issues that have arisen from them, I think this new format will be the best way forward. PS: One thing we often hear is that folks want us to “take care of locals.” We definitely agree - we love our Colorado fans! This is why, in addition to the online release system we also have bottles for sale, to go, every single day in the tasting room! We spent nearly a year holding back beer from releases so that we could make this happen, and I’m ecstatic to say that now anyone who comes to our tasting room can take a bottle of Black Project with them when they leave. Additionally, we are very proud of the fact that we typically average ~70% of entries from Colorado residents in our online releases, and I don’t see any reason why the new format would change that. Black Project is proud to announce the return of a beer from our early days, a fan favorite, and a beer that we’ve had constant requests to recreate: LANCER. Last released way back in February 2016, LANCER is a sour blonde ale made with Colorado wildflower honey. The beer is a product of the combination of microbes captured via our coolship and those found naturally in the honey. We believe that our use of high quality honey and a long, slow, mild fermentation by wild microbes protects and amplifies the delicate wildflower aroma. This is a beer that is surprisingly difficult to successfully make. The truth is, we planned, brewed, and blended a batch for 2017 but ultimately decided that it wasn’t up to our standards. There is a fine line that we must walk between using enough honey for the end result we want and over-stressing our fragile wild yeast. The first time we made this beer, it took several months longer to be fully ready in the barrel than I had thought. Then the beer also proceeded to take it’s time with refermentation in the bottle- if I recall it took about 3-4 times longer to be fully carbonated and ready to sell than most of our other beers. 2017 LANCER was never bottled. It was dumped nearing the end of the honey fermentation in the barrel. We immediately worked to re-blend, acquire more honey, and make a new batch with some lessons learned from the beer we dumped. This year’s version is now finally ready, in bottles, for our November lottery. In this batch, the secondary fermentation of the honey proceeded beautifully, slowly, and cleanly - leaving a tremendous amount of wildflower aroma. These floral notes mingle with the funky barnyard and stone fruit of the base beer. Bottle conditioning took several times longer than normal, again! We are finding that our mantra of letting time be our most important ingredient definitely holds true when combining our cultures with large amounts of honey. 2018 LANCER is the best batch yet, and we are all really proud to offer it again to the public. This beer will be released in our usual format, a majority of bottles available to the public will be sold via online lottery, and a small percentage will be held back to be sold over time in the tasting room (for on-site and to-go) from our bottle cooler. Bottles are corked and capped, 500mL, and cost $18 each including sales tax and all fees. Lottery entry window will run from Monday, November 19, at 12 noon (MST) through Thursday, November 22 at Midnight (MST). Bottle Pickup window will be November 30 - December 2nd, during tasting room hours. I'm proud to announce the release of the 2018 version of OXCART. This is one of the most special beers that we make at Black Project. It is a blend of 1, 2, and 3 year old traditionally-produced spontaneous ale. OXCART exceeds the requirements to qualify for the Methode Traditionnelle III crest. This means that although it is produced outside of Belgium and thus should not be called "gueuze" or "lambic" it is made using the same traditional processes and ingredients. Production of OXCART starts with a turbid mash of 50-60% Pilsner malt and 40-50% unmalted wheat. The percentages differ as we actually make 3 different recipes with slight differences in grist, mash schedule, and hopping rates. The idea behind this is to create some slight differences for diversity in blending stock, years down the line. In any case, after the turbid mash creates a very dextrinous, starchy wort, it is boiled for 3-4 hours with a large amount of aged whole leaf hops. The hops we currently use are 2013 Brammling Cross hops from the UK that have been aged at ambient temperature since harvest and in our own barrel cellar for the past two years. We bought these hops in bulk to last multiple years, but we are also currently aging a large amount of Colorado-grown leaf hops - which will start to be blended in over the coming years. Following the boil, the wort is cooled in our ~360gal copper coolship, located under a large window in our barrel cellar. As the wort cools overnight (we only brew from late fall to early spring, so the outside night air is quite cool), yeast and other wild microbes innoculate it with many different types of microbes that will be involved in fermenting and aging the beer over the coming years. In the morning, the wort is pumped into steam-sanitized barrels (we want to encourage the microbes to come "spontaneously" from the air, not from previous batches in the barrel). After a few days, the wort begins to actively ferment. It develops alcohol and the pH begins to drop, setting the young beer up the full transformation that will happen over the next 8 to 36+ months. The next and most important part of the creation of OXCART is blending. I taste through barrels in the cellar and come up with a blend that meets the requirements for age, but as important is the overall flavor - my goal is to blend a beer which tastes interesting, appealing, and characteristically "Black Project." This year, two blends were made, OXCART A and OXCART B. The two beers share a common core, but do have some differences in an attempt to showcase a bit of the range that can be made just by selecting different barrels. These two blends were both bottled in the early days of 2018 and now the "A" variant is ready to be made available to the public. It will be released in a lottery format - entries for it start today - and there will also be some limited availability throughout the year as on-site bottles in the taproom. The bottles are 375mL, corked and capped, and cost $22. Stay tuned info and comparisons with the second blend, which we have scheduled to be released in October. MACH-LIMIT starts with wine grapes from locally-sourced, family-owned vineyards in Palisade, CO. Once the grapes have been destemmed and crushed, we allow the juice to rest for a few days - developing rich color and depth of flavor - before finally transferring the juice to neutral oak barrels along with beer from our spontaneous solera vessels. The beer then goes through a secondary fermentation with the grape juice, followed by additional aging in barrels. MACH-LIMIT is fruited at the highest limit allowed, thereby creating a beer that is truly something of a hybrid with intense grape character - almost sangria-like. To highlight the extreme wine-like character of this beer, it is bottled with only a very minimal amount of carbonation. This beer should age well with proper cellaring, however the grape character may diminish over time. LOTTERY WINNERS WILL HAVE ONE VARIANT RANDOMLY SELECTED DURING THE LOTTERY PROCESS. YOU WILL NOT HAVE A CHOICE OVER WHICH VARIANT YOU WILL RECEIVE A VOUCHER TO PICK-UP. THEY ARE BOTH EQUALLY DELICIOUS! Please click the button below to go to the lottery entry form. Before entering, please read the entry form page very carefully and note the terms and conditions, which you must agree to before entering. This year we decided to experiment for the first time with a high-quality fruit product that is made by removing water from pure fruit juice, allowing us to create a beer with an extreme amount of fruit character that can be infinitely blended and fine-tuned. ATLAS & THOR both received heavy amounts of pure fruit. These sister beers are made using the same base beer and fruits, but with different amounts of the black currant and plum. ATLAS is 75% black currant and 25% plum and THOR is 75% plum and 25% black currant. The bottles are only available as a set and are meant to be opened and enjoyed together. Online lottery entry window opens for four days. You MUST use the name (verbatim) that is found on your valid, state-issued ID. If your name is "Robert" on your ID, but you go by "Bob", please fill out the entry using "Robert". Do not enter the lottery if you cannot pay for the voucher during the payment window. Do not enter the lottery if you (or your proxy) cannot pick up bottles during pick up window. Please check your junk email, promotions folder for Gmail, and Focused folder for Outlook. Payment information must match the winner's entry information. Online lottery entry window opens on Monday, February 26, 2018 at 10AM MST. Do not enter the lottery if you (or your proxy) cannot go to Black Project during the pickup window. Since our new lottery format has allowed more people to buy their first Black Project bottles, we wanted to make sure that everyone is aware of the fact that all our bottles are all bottle conditioned and highly carbonated. What this means is that before opening any of our beer, it is very important that the beer is chilled in a refrigerator for the 24 hours immediately prior to serving. These beers are highly carbonated, in line with carbonation levels of traditional Lambic from Belgium, and the bottles we use are very high quality and thus are very thick and insulative. So it is very important that all bottles are properly chilled for 24 hours before you open the bottle. If not, some gushing and beer loss may occur. We don't want that. We extensively test each batch and know that there are there is no issue with over-carbonation, the beer is simply carbonated to the high level that is historically associated with the style. All Black Project bottles can, and should be stored warm, before chilling for 24 hours (ideally at "cellar temperatures" of 55-60°F). Since all of our beers are unpasteurized, they will continuing to evolve and change while aging. If there are any issues with any bottles ever, please contact topsecret@blackprojectbeer.com and we will do our best to remedy the situation. Our cold-steeped coffee sour golden series returns with a new single origin blend. Today we are releasing GEMINI | Konga Wote in partnership with Corvus Coffee. This is the latest variant in our GEMINI series, which explores the unique characteristics of single origin coffee beans by extracting complex flavors using our spontaneous solera sour golden as the canvas. Konga Wote is an Ethiopian coffee bean from the Wote Konga Cooperative in Gedo, Ethiopia. This is the second year Corvus Coffee has worked with Seife Tulloskorpi, an exporter, and Israel Degfa, a renowned coffee producer in the region. By partnering with Corvus, we're able to showcase unique coffee beans from across the world that are being produced by small farms in select regions. Each new beer release in the GEMINI series will highlight the unique flavors and aromas of each coffee roast, something that Corvus Coffee specializes in with their Single Origin coffees. Since all the roasts are from a single origin, each beer will be as unique as the beans. This is an intensely floral coffee, with earl grey and bergamot notes, citrus acidity, and some unusual flavors with prominent esters and stone fruit notes. GEMINI is named after “Project Gemini”, NASA's second spaceflight program. The aircraft carried two astronauts around Earth's orbit in the early 1960s, furthering our understanding of space and developing the techniques necessary to land on the moon. It was also responsible for pioneering orbital maneuvers necessary for working in space. Through continuous innovation and exploration we hope to continue to push spontaneously fermented beer into unknown territory, leading to new discoveries, the same way Project Gemini made it possible for us to land on the moon. Starting today (Friday) at 4pm, bottles of DREAMLAND, our spontaneous solera golden sour, will be available for purchase from the taproom, every weekend (Friday, Saturday, and Sunday), with a limited allotment of cases for each day and a limit of 2 bottles per person. Note- These two new systems may be combined for special releases, where bottles are available for to-go with limited daily allocations as well as online through a lottery system. Our hope is that locals that are unable to wait in line on Saturday’s, can get bottles to-go, as well as customers that are traveling to Denver. In time, there is the path that we know, and the path that has yet to be discovered. Spontaneous fermentation will always be the discovery of the unknown. It is our job to guide the journey. While we are hopeful in the end result, knowing that destination may change, that it may alter, the goal has always been to challenge the past with every step forward. In this regard, any variation from time honored tradition, puts us directly in the path of creation itself. TAGBOARD begins as a blend of lambic-inspired, coolship spontaneous beer, brewed in accordance with the Méthode Traditionnelle guidelines*, which was then combined with fresh picked Neomexicanus wet hops from Voss Farms Colorado, in Arvada. Instead of treating this like a traditional dry-hopped beer, we added the hops into several neutral oak barrels, as if we were adding fresh fruit. Each barrel received over 20lbs of wet hops, which were then filled with the blend of lambic-inspired, coolship inoculated spontaneous beer, that was aged for one, two, and three years in separate oak barrels. For two weeks, we let the wet hops soak in the barrels, infusing fruity, citrus, and dank flavors from the hops into the beer. The slightly sour, funky, and traditional-tasting base beer meshes together with sweet pine, melon, and berry characteristics from the hops. This is a single keg, one-off blend, of the larger batch, which will be available in bottles in several months. Ultimately, our goal is to make this a wet hop sour unlike any other, as an experiment in time and aging. Wild microbes like ours are known to be able to bio-transform hop aroma compounds and flavor compounds, releasing new and interesting flavors from the hops as the beer ages, allowing a new experience in the transformative powers of our microflora on local Colorado hops. Enjoy this special blend on draft now, then plan on buying bottles of the main blend when it is released in the future. Late last year I was extremely excited to see Jester King and others introduce a certification mark for traditionally made coolship beers. You’ve probably heard of it, it was called Méthode Gueuze, and there was also the more general Méthode Lambic. The idea of a certification mark for beers produced in certain ways is not new, I’ve long been an advocate for accuracy in naming types of sour beers. Being a big fan of Belgian beers, it is hard not to notice the distinct “Brewed in Belgium” and “Trappist” badges that adorn a lot of my favorite bottles. It definitely made sense to me that we should have a similar mark for different types of sour production, as I feel there is a ton of confusion and even some outright deception in that market. So, again, without a doubt, the mark published by the fine folks at Jester King definitely interested me. The MG/ML marks, as many began to call them, were created to give a name for beers that were inspired by the unique production methods of Belgian gueuze and lambic, but that were not brewed in the Pajottenland region of Belgium. I know myself and many others feel strongly that a beer called lambic/gueuze can only come from this area around the Zenne River valley. As a brewer of beers made following the traditional process which are used there, it becomes difficult to figure out what to call our beers stylistically. When it comes to beer style names, on one hand we want to honor the idea that our beer is not lambic as it is not made in Belgium. On the other hand we want to be able to concisely explain to our customers the complex and very special process that is used to make many of our beers. Raw wheat, turbid mashing, 100% spontaneous coolship inoculation, barrel fermentation, etc - these are not required to make sour beer, they aren’t required to make great sour beers, even. However, these are the methods we have chosen to use in many of our beers, and we want to be able to share that information with our fans. Furthermore, as a consumer I think it is important to have an idea of how a beer is made when you see it on a store shelf or on a menu. All of these issues were wonderfully solved by Méthode Gueuze / Méthode Lambic… until it came to everyone’s attention that perhaps not all of the actual Belgian lambic producers were OK with this name. Specifically, the High Council for Artisanal Lambic Beers (HORAL), which is an organization representing the vast majority of Belgian lambic breweries, said that they did not agree with the names/marks. This came as a surprise to many of us, including the creators of the marks. Eventually private emails became public and the beer world at large wondered what was going to happen. Some brewers continued or even began using MG or ML after it was clear HORAL did not agree with it, others - like Black Project - decided to wait and see what kind of resolution could be found. Soon after, I was honored to have been invited to join many of my idols in the sour beer world to help shape and define the standards for Méthode Gueuze and Méthode Lambic. In June, as part of this involvement, I was able to travel to Lot, Belgium to a meeting at the 3 Fonteinen Lambik-O-Droom. The meeting included myself, Jeffrey Stuffings from Jester King, Pierre Tilquin from Gueuzerie Tilquin, Werner van Obberghen from 3 Fonteinen, and Frank Boon from Brouwerij Boon. It still feels pretty unreal and incredible to be included in that group. It was a great meeting with lots of great discussion (and plenty of great lambic poured for us by Armand DeBelder of 3 Fonteinen). Afterwards we spent time touring both the 3F and Boon facilities, a day I will never forget, but I digress. Ultimately it was agreed that Méthode Gueuze and Méthode Lambic would be replaced by new marks which did not mention the words lambic or gueuze. It was agreed that there was no issue with American brewers following the traditional process to say in a description of their beer on labels that it was inspired by lambic/gueuze, but that those words shouldn’t be the style description or name of the beer. I don’t necessarily personally agree with HORAL that American Méthode Gueuze beers would be confused with real Belgian Gueuze beers sitting next to them on a shelf. However the much bigger issue for me is that MG was a mark created to show respect for the Belgian producers and if a large number of them felt it was disrespectful, it doesn’t make any sense to use it. From the meeting with HORAL, a small group of U.S. brewers who are currently producing these traditional beers, began work on defining a new set of standards: Méthode Traditionnelle representing traditional lambic-inspired production methods and then Méthode Traditionnelle - 3 Year Blend representing gueuze-inspired aging and blending. In my view, the creation and use of these marks is a huge step forward for naming, styles, and transparency in the American sour beer industry. Sour beer brewers in the U.S. are a small but passionate group, and make beer which an extremely diverse range of processes. To those brewers who follow the traditional Belgian-inspired processes, I would kindly ask you to consider using the Méthode Traditionnelle crests where applicable. For those that don’t make beer following this process, I would encourage you to work with others to figure out if there is a way to similarly define your methods to generate more clarity in our tiny slice of the craft beer world. Black Project is extremely excited to now be able to use the Méthode Traditionnelle certification marks on our beers, knowing that the standards are clearly defined and that the marks are not causing contention with the producers who inspired us. You will begin to see the “MT” or “MT3” crests on relevant bottles of our beer very soon. Thanks so much for reading. I will be doing a Facebook Live Q&A this evening at 6PM (MDT) to talk about Méthode Traditionnelle as it relates to Black Project beers. Please note that this Q&A is not in any official capacity related to the Méthode Traditionnelle standards, but I am happy to answer questions from the Black Project / my personal perspective. 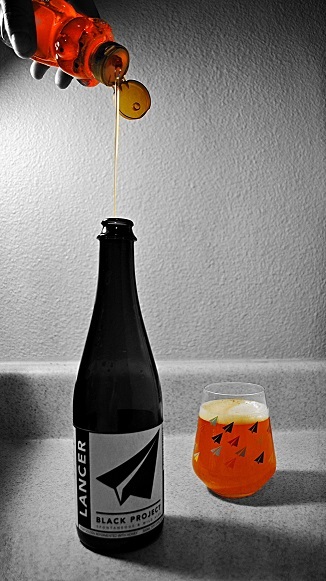 The idea behind Black Project Spontaneous & Wild Ales has always been a dream of ours. Spontaneous fermentation is fascinating to us, so our mission defines that dream. Our goal is to explore what is known and to challenge what is possible. When we first started the brewery three years ago, Black Project used two 60gal stockpots as our coolship, both purchased on a shoestring budget after our initial attempt of adding a coolship to our brewery with a KickStarter failed. This meant that we had to be creative. Every time we brewed a new spontaneous beer, we would hoist both stockpots (empty) up to the roof of the brewery, then pump boiling wort through a 75ft hose, from the brewhouse, out the back doors, up to the coolship. We'd cover the pots with a nylon-mesh screen, then come back in the morning to pump the now-cooled wort, back down to the barrels. I will always fondly remember being on the roof, watching the coolship fill in the darkness with large columns of steam rising from each vessel, illuminated by a small work lamp. The temperature was often below freezing, but the warmth from the wort kept it from being too uncomfortable. However, the nostalgia of those nights doesn't erase the memory of how cold it was when coming back to empty the coolship, early in the morning, quite often still below freezing with the wort now being in the 60s. That meant no help staying warm waiting for the wort to be slowly pumped down into barrels. This early coolship system allowed us to cool 120gal of wort and fill two oak barrels almost exactly to the brim. It worked. The cooling rate was perfect, the inoculation surface area was ideal, and a little exercise going up and down the ladder certainty didn't hurt. That being said, one of the most exciting times for Black Project came last fall when we were able to expand our facility by an additional 1,000 square feet by subletting space from the shop next-door. We even cut a doorway through the brick into the building and walled off a part of the neighboring tenant's space. As soon as the walls were up, we immediately filled the room with about 100 additional neutral French oak barrels. Next, we moved our existing barrels into the cellar, bringing the total number of oak barrels closer to 140. A few months later, we added a 1200L foeder and four 450L puncheons. As we added all of these oak vessels, I knew we wouldn't be able to easily fill them all in a winter using our existing rooftop coolship vessels. The time had come to build a custom coolship. I worked with Spencer Langford from Langford Distillery Systems to specify the dimensions and structure of a new coolship to be situated under a large window in the barrel cellar. Late last fall he completed the work and delivered the coolship. It is 360gal with a divider in the middle for single batches, constructed as a copper tub that free-floats in a heavy duty stainless steel frame. We also slightly reconfigured our brewhouse to allow brewing 5bbl batches of lower-gravity beers. All of our lambic-inspired wort in the 2016-2017 season was brewed using this coolship and the results and have been extremely promising. The depth and volume are the exact dimensions that I feel yield the ideal cooling rate for this style of beer making. The divider allows for some split-batch experimentation and also for single-turn brew days when necessary because of time or ingredient constraints. We couldn't be happier with the new coolship and everyone at Black Project is really proud of it. The coolship and the barrel room are always a high point for visitors getting tours of our small facility. That being said, since we started small and since we are still very small, in the grand scheme of American breweries, we refuse to compromise, take shortcuts, or otherwise sacrifice what we believe in so that we can produce more beer. This means that we may not be able to easily accommodate the demand for our product. However, the good news is that, just like our coolship that went from two huge stockpots on our roof to a beautiful custom-built copper piece of art, we are continuing to slowly grow our production while still increasing quality and innovation in our beers. Over the last few months, we have been planning several new versions of popular beers to return to the brewery, building relationships with local growers and maltsters, will be debuting several new lambic & gueuze-inspired blends and variants later this year. ROSWELL is our largest release to date, with 420 bottles available to the public. This may not be a lot in comparison to many breweries, but it is a significant amount of beer for us, considering most of our beer takes nearly a year or more to produce. Please know that we do our very best to ensure all of our beer is as available as possible. Specifically, when we set bottle counts for release days, we have always, and will continue to always, strive to find the best compromise between high allotments and more availability. We thank all of our fans for their continued commitment to our beers, as well as for their continued understanding that as a small brewery making long aged spontaneous beers we sometimes may not be able to keep up with the demand for those products. Thanks again for your understanding and for your passion for what we do. Earlier this week, Sam Calagione issued a request to RateBeer asking that they remove all Dogfish Head beer reviews and mentions on the RateBeer website. We've received your inquiry about content removal from RateBeer. It is not the success of the resistance that matters, it is the resistance itself. We do not buy ABInBEV products, we do not attend festivals sponsored by ABInBEV, and we do not support businesses that benefit ABInBEV. We will also make every effort possible to make sure our brand and products do not contribute to their businesses in any way. Now, we can debate the role other large companies have in craft beer, what breweries should be considered craft and which ones are not, or what constitutes "independent" ownership, but for us, none of these issues are as important as the ethics a company follows when conducting business. In this, ABInBEV stands alone. ABInBEV wants to see your local brewery wiped off the map. They are not interested in buying craft beer breweries to "improve efficiencies" or "provide resources", instead, they are systematically acquiring strategic businesses to limit and disrupt the resources and avenues we depend on. They have a history of limiting distribution, they have been fined on multiple occasions across the country for pay-to-play agreements, they have spent millions of dollars on advertisement insulting and belittling craft breweries, and they have acquired breweries we all loved, just to undercut us all with pricing, selection, and availability, in an attempt to flood the market with their mass produced beer, while watching everyone else drown. The simple fact is this, ABInBEV invested in RateBeer for a reason, and they would not invest if they didn't see either a profit financially or in other forms. There are some already saying that they are interested in the user information, brewery information, and the potential for monitoring trends using RateBeer's data. Which as so many have pointed out, is user created. We don't want anything to do with any organization that ABInBEV profits from. Period. We feel that a journalistic organization that is partially owned by the largest commercial entity in the industry it covers is not independent, nor trustworthy as a journalistic organization. "Please remove "Black Project Spontaneous and Wild Ales" and "Former Future Brewing Company" as well as any mentions, logos, or labels of these breweries from your review database. We feel that the Ratebeer.com partnership with ABInBev dba ZX constitutes a serious conflict of interest and prevents this site from acting as an independent journalistic organization. We are withdrawing any and all permission for our names or trademarks to be used by Ratebeer.com or any of it's affiliates. Thank you for your help and compliance with this matter. If you wish to verify the sender, as I suspect you will, of this message before acting, please contact topsecret@blackprojectbeer.com. We are expecting a full removal from the site within 7 days unless we hear otherwise from you. Thanks again. Former Future Brewing Company, LLC dba Black Project Spontaneous and Wild Ales"
This morning, we received an email from Walt Dickinson, of Wicked Weed Brewing Company, a few minutes before the news appeared publicly, informing us of the big news. When we checked online, our social media feed was flooded with posts about Wicked Weed and ABInBev. Personally, Sarah and I were shocked to learn of ABInBev's acquisition of Wicked Weed, and we still are. We consider Walt and the rest of the Wicked Weed crew to be friends and we are happy for them and honestly wish them the best.